Strong low pressure is well to the east, over Lake Huron, and continues to move away from our region. A very large ridge of high pressure extends from the western shore of Hudson Bay in Canada southward across the Dakotas to the Texas panhandle. The gradient between the high and low is still rather tight so winds will be rather brisk from the northwest to north today at 12-24 mph with some gusts above 30 mph. It will be cool with a high only in the upper 50's. Winds did die down tonight as the high gets closer to the Stateline, and with clear skies the temperatures will drop into the middle 30's. Patchy frost is possible after midnight, and may be more widespread over northwestern Illinois. So a FROST ADVISORY has been issued for Stephenson county for tonight. High pressure sitting over Wisconsin on Saturday will provide the area with sunny skies and a light northerly breeze . The high will only be around 57 degrees. On Saturday night the center of the high will be very close to the Stateline. So, with nearly calm conditions, clear skies, and strong radiational cooling, the temperature will drop very close to freezing. Widespread frost can be expected late Saturday night lasting through the early morning hours on Sunday morning. It could be the official ending of the growing season of 2011. If you have any tender plants that you would like to keep alive, it would be a good idea to either cover them up the next couple of nights, or bring them inside. The ridge will remain over the area on Sunday as the center of the high moves southward across Illinois. The cool air will moderate with a high on Sunday afternoon around 67 degrees with full sunshine. Each day will get a little warmer next week with low 70s on Monday to around 80 degrees by Thursday. Skies will remain sunny to mostly sunny for the entire week. Here's a preliminary look at peak wind gusts from around the area. A strong area of low pressure over the Upper Peninsula of Michigan is partially responsible for the strong northwest winds we have experienced and are still experiencing this evening in some cases. In addition, strong upper-level winds are mixing down to the surface at times as sporadic showers move through the area. These showers have their own miniature downdrafts that are allowing the stronger wind from above to temporarily reach the surface. We are still under a wind advisory through 5am Friday morning. Although winds will diminish some on Friday, we could still experience occasional gusts up to 35 mph. The old closed low has shifted off to the east, and is no longer the dominant feature affecting Stateline weather. The jet stream is now diving into the Midwest from central Canada. The pattern shift will push a cold front across north central Illinois during the mid day hours. An intensifying surface low over Lake Superior will cause a tight pressure gradient across the Stateline by mid afternoon. So, a Wind Advisory has been issued for the area as of 2 pm this afternoon, and it will be in effect until 5 am on Friday morning for the Greater Rockford area, and the surrounding counties. Winds will switch from southwesterly to northwesterly, and increase to 20 to 30 mph with gusts to 45 mph this afternoon, and perhaps as high as 50 mph in the Freeport area. Also, there will be some showers associated with the frontal passage. The temperature will reach the upper 60's today before falling back as cooler air moves in this afternoon. Windy conditions will prevail until the Canadian high pressure gets closer Friday evening when the wind is expected to die down to 10 to 15 mph on Friday night. If the wind diminishes to near calm... with clear skies, and temperatures in the middle 30's, there could be some frost. 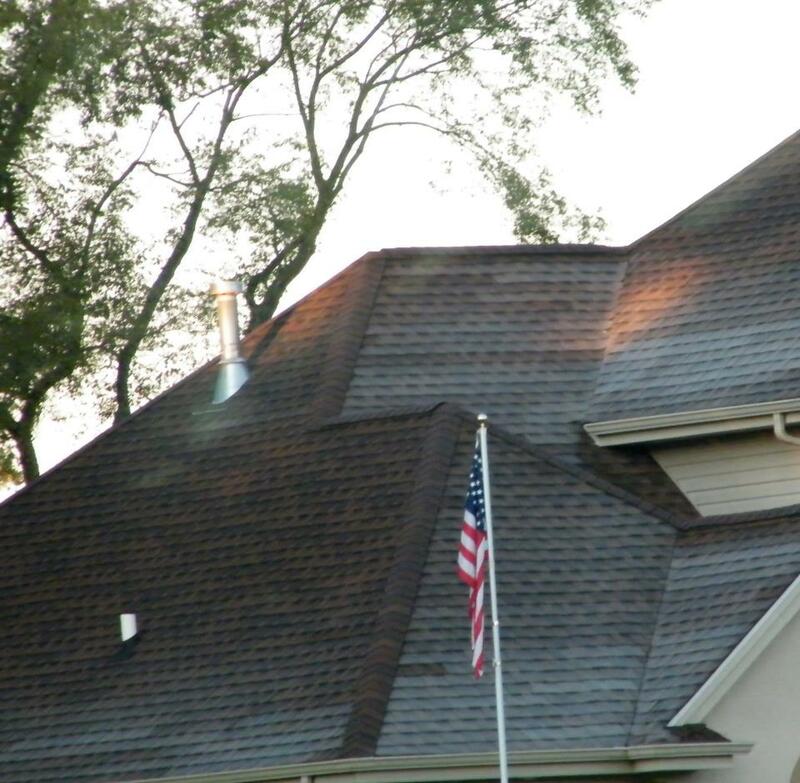 If the wind is able to maintain itself above 10 mph, no frost is likely to form. With the Canadian high pressure overhead it will be a sunny cool day on Saturday with a high only in the upper 50's. Saturday night will be another chilly night with lows in the middle to upper 30's. A warming trend will start on Sunday with temperatures lifting into the middle 60's under sunny skies. A extended period of delightful fall weather will continue through the middle of next week with more sunshine, and very comfortable temperatures in the low to middle 70's. Low temps at night will be in the 50's. A WIND ADVISORY REMAINS IN EFFECT FROM 4 PM THURSDAY TO 5 AM CDT FRIDAY. AND LIMBS MAY ALSO OCCUR. That upper-low that bought us the heavy rain on Monday has shifted a little eastward, and is located over extreme southwest lower Michigan this morning. Clouds continue to rotate around the low through north central Illinois. With much of the moisture wrung out of the system, only light scattered showers will affect the area today. Drier air is breaking up the clouds across Wisconsin, so skies are expected to become partly cloudy today. High temperatures, with the help of some sunshine, will be boosted into the upper 60's this afternoon. A brand new cold front will sweep across the area on Thursday. Only light scattered showers are expected, but the wind will pick up from the northwest at 15 to 25 mph in the afternoon with gusts to 40 mph. An intense surface low spin up over Lake Superior and move east across Lake Huron. With a strong pressure gradient, it will remain windy through Friday. Chilly high pressure from Canada will follow in behind the system. On Friday night high pressure will ridge from the center of the high on the northwest shore of Lake Superior southward along the Mississippi River. Skies will be clear. The wind will die off, and temperatures will drop to the mid to upper 30's with a chance of frost. High temperatures on Saturday will only be in the upper 50's, and with high pressure centered right over the Stateline on Saturday night it will be clear, and cold again. With sunny skies on Sunday, and a light southerly wind developing, temperatures will recover to the middle 60's by mid afternoon. You can expect more sunshine on Monday, and very pleasant conditions with 72 degrees expected by 3 pm. Here are a few rainfall totals from the Stateline area from Monday and Tuesday. An upper-level low pressure system continued to squeeze moisture out of the atmosphere yesterday and today, giving us our 3rd wettest September day (Monday) since records began in Rockford. The upper-low is now located in NW Indiana. Although it continues to slowly drift to the east, there is still some moderate to heavy rain well to the west of the low's center. The Quad Cities, for example, reported moderate rain at 10pm tonight. It's conceivable that a brief period of moderate rain will fall around here sometime tomorrow morning as showers wrap-around the backside of this departing low. That pesky old upper-low is still sitting and spinning over northern Illinois today, and it will inch it's way to southern Lake Michigan by evening, and wobble around that area overnight into early Wednesday, keeping the showers going for the Stateline. It produced record amounts of rain yesterday with a total of 3.93" at the Rockford airport. No heavy rains are anticipated today with the system losing a lot of it's punch, having rained out most of it's moisture. Highs today will be held down to near 60 degrees with the cloud cover and rain showers. Expect scattered light showers tomorrow with a high near 67. A strong cold front will blow through the area on Thursday. Temperatures could reach 70 degrees before falling off during the afternoon. There will be a slight chance of showers with the front, but nothing significant is expected. On Friday a post frontal trough of low pressure could generate some instability showers, but once again only light scattered amounts are expected. Canadian high pressure will clear skies, and drop temperatures on Friday night, as it settles southeastward to near Eau Claire, Wisconsin by 6 am Saturday. It may be cold enough for scattered frost late Friday night into early Saturday morning with a low around 37 degrees. It will be sunny, but chilly on Saturday with a high only in the upper 50's. It will be clear and cold again on Saturday night with a low near 38 degrees. Sunday will be sunny and warmer with temps topping out near 67 degrees. Here are some rainfall totals as of 8pm from across the Stateline area. The 3.56" of rain that you can see at the Rockford Airport is a record for the date, and the 4th highest total for any September day on record! Although it appears that the heaviest rain will be to the south and east of the area overnight, additional rainfall totals of 0.5" or higher are still possible over the area. (11:25:21 AM) nwsbot: LOT: Kingston [Dekalb Co, IL] broadcast media reports HEAVY RAIN of E2.00 INCH at 11:14 AM CDT -- update to previous report. measured 1.35 at 8am. report relayed from public. (11:51:28 AM) nwsbot: LOT: Rockford [Winnebago Co, IL] broadcast media reports FLOOD at 11:24 AM CDT -- flooding at the intersections of sandy hollow and alpine. also at 11th between sandy hollow and harrison. (11:51:28 AM) nwsbot: LOT: Rockford [Winnebago Co, IL] broadcast media reports FLOOD at 11:24 AM CDT -- flowing water almost up to the curb at harrison. (11:51:28 AM) nwsbot: LOT: 1 W De Kalb [De Kalb Co, IL] trained spotter reports HEAVY RAIN of M1.34 INCH at 11:30 AM CDT -- total since midnight. (11:51:28 AM) nwsbot: LOT: Sycamore [De Kalb Co, IL] trained spotter reports HEAVY RAIN of M1.84 INCH at 11:30 AM CDT -- at heron creek. total since midnight. (11:51:28 AM) nwsbot: LOT: 1 N De Kalb [De Kalb Co, IL] trained spotter reports HEAVY RAIN of M1.62 INCH at 11:30 AM CDT -- total since midnight. (11:51:28 AM) nwsbot: LOT: Sycamore [De Kalb Co, IL] trained spotter reports FLOOD at 11:30 AM CDT -- ditches are full north of route 64. (12:01:45 PM) nwsbot: LOT: Rockford [Winnebago Co, IL] trained spotter reports HEAVY RAIN of M2.50 INCH at 11:59 AM CDT -- 1.0 inches at 8am. still raining at time of report. Heavy rain will continue to fall through this afternoon as the center of low pressure moves closer. As of 11:45am the heaviest of the rain is just south of downtown Rockford and extends through southern Boone County and then back through DeKalb County. There have been several reports of over an inch of rain that has fallen so far this morning area-wide and with this recent bout of heavy rainfall there has been some flooding on roadways. Drier air to the north in southern Wisconsin and northwest Illinois has cut-off their rainfall. I'm not really expecting this to make too much of an impact on us through the afternoon. Why the rain and wind? A strengthening low currently sits in southeast Wisconsin this morning and will continue to move west, eventually into southwest Wisconsin later today. The image on the left shows where pressure is falling and where the pressure is rising. Low pressure will move in the direction where the pressure is falling. Here, the solid blue lines represents pressure falls within the past three hours. Right in the middle in southwest Wisconsin there was a pressure fall of 4 mb. That's a pretty good pressure dip and so that tells us as meteorologists that the low is still strengthening. And as it continues to strengthen the wind field around it will continue to increase. Wind gusts today will possibly reach 30-35 mph. To the south of this low in central Illinois and extending into Indiana are blue dashed lines. These lines represent where the pressure is rising. This is also where a little more dry air is getting wrapped into the low. As a low strengthens it's going to increase the upward motion within it. When you increase the lift within a storm the showers/storms are likely going to increase as well. This is why we've seen a good amount of rain so far this morning. Actually, there has been a pretty heavy rain band situated over Lee County this past hour. Moisture will continue to get wrapped into this system until the surface low weakens and moves closer to the upper level low. Unfortunately it does look like we've got a couple more days of rain ahead of us. 8:00am Update: Heaviest of the rain is now located in Stephenson, Ogle and Lee counties. Freeport, German Valley, Ridott, Rochelle, Byron, Oregon, Mt. Morris, Amboy and Dixon watch for that heavy rain to continue which may cause some localized flooding in some of the low lying locations. These showers will continue to spiral in from south and southeast as the surface low pressure system moves into southern Wisconsin. 5:30am Update: Rain, heavy at times, will continue this morning and even into the afternoon. As the upper level low sits just to our southwest the surface low pressure system is in northwest Indiana. This low will continue to deepen and move west through the morning and afternoon. As it does, the showers will unfortunately continue across northern Illinois but drier air moving to the north may cut off a few of those showers into southern Wisconsin. With this expansive band of rain I wouldn't be surprised if there are some totals of an inch or more by this evening. The surface low won't move much over the next 48 to 72 hours so look for the clouds and on/off showers to continue through Tuesday and Wednesday. The pesky old cut off upper low continues to circulate over the Stateline. It is responsible for the cool temperatures, clouds, and showers. Surface low pressure developing over western Kentucky this evening will move rapidly northward, and be located near Chicago before daybreak on Monday. Rain will spread northward overnight, and could become heavy late tonight along with some thunder and lightning. Temperatures will drop off into the middle 40's to near 50 degrees tonight under mostly cloudy skies. On Monday rain showers will be likely, and there could be some isolated thunderstorms in the morning. The models are printing out some surprising precipitation forecasts for the next 2 days with totals between 1" and 1 and one half inches. That is hard to believe, but this weather pattern is highly unusual. It will remain cool with scattered showers, and highs in the 60's through Tuesday. The old upper low is moving so slowly that here could even be a few scattered showers lasting into Wednesday morning. Temperatures will begin to recover, however, with more sunshine. The high on Wednesday will be close to 70 degrees. On Thursday the next cold front will blow across the area from the northern plains. Highs on Thursday will reach the 70's again, and there is a slight chance of showers. Cooler Canadian high pressure will follow in behind the front dropping temperatures back into the 40's at night, and the 60's for afternoon highs. It's a little early to say, but it's possible that under ideal conditions, the overnight low, on Friday night/Saturday morning, could even drop to the mid to upper 30's with a chance of frost. That's pretty far out, and we will fine tune the forecast as the week progresses. Look for a recovery in temperatures into the upper 60's by next Sunday. The 8 to 14 day extended forcast is calling for above average temperatures, and below normal precipitation. Numerous waterspouts were reported off the shores of Milwaukee and Chicago over Lake Michigan Saturday. As I talked about before very cold air associated with a very strong closed upper level low moved over the relatively warm waters of Lake Michigan. As this happens the warmer air below quickly rises because it's warmer than the air it's moving into. The very rapid vertical motion helps generate increased instability within the thunderstorms. The Chicago National Weather Service put together a very detailed description on the types of forecasting tools they use to forecast waterspouts. The pesky old cut off upper low continues to circulate over the Stateline. It is responsible for the cool temperatures, clouds, and scattered showers. Temperatures will drop off into the middle 40's tonight under mostly cloudy skies with light northeasterly winds. On Sunday and Sunday night rain showers will be likely, and there could be some isolated thunderstorms. The models are printing out some surprising precipitation forecasts for the next 2 days with totals around 1.25". That is hard to believe, but this weather pattern is highly unusual, and the upper low is expected to draw a new surface low from the southern plains right into the Stateline. It will remain cool with showers off and on, and highs in the 60's through Tuesday. By Wednesday the upper low will be much weaker, and what's left of the system will be swept off to the east as the westerlies take over. Wednesday should be mostly sunny and warmer with a high in the low 70's. On Thursday, high pressure will be in control, and it will be located over the Tennessee river valley. It will be sunny with a southerly wind allowing afternoon temperatures to reach the middle 70's. The next cool front will pass through the Stateline on Thursday night along with a slight chance of showers. The Canadian air behind the front is not exceptionally cool, so temperatures will drop back into the 60's for highs on Friday and Saturday with plentiful sunshine. Here is a LIVE view over Chicago from the Willis/Sears Tower Webcam from Fox Chicago. Maybe you'll see a waterspout! There have been several reports of waterspouts east of Milwaukee and Chicago so far this morning! 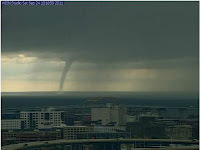 Here is one large waterspout just east of downtown Milwaukee that was caught by WISN-TV webcam. We may even get a couple cold air funnels! FROM CLOUD BASE TO WATER. Next week Ty, Eric and I will be having a weather meeting to discuss how things have gone so far this year and to look forward into the upcoming winter weather season and beyond. We are also going to be looking at ways we can improve our daily weathercasts and the way we get information out to you. What we want to know is what do you like, or don't like, about our weather. Do you like the updates on the blog? Would you like more of them? Do you find our weathercasts to be informative? Would you like to see more of the weather chat when significant weather occurs? Please take this time to let us know how we're doing and what we can do to better serve you! Email your comments to: weather@wtvo.com and we'll be sure to include them into our meeting next week. As we head into the weekend it unfortunately looks like our rain chances may increase - especially further east of Rockford. As that pesky upper level low moves over the Great Lakes tonight and Saturday it will come with a very cold pocket of air above. Temperatures around 16,000 ft will probably fall to -28°C, which is roughly -18°F! Any sunshine that occurs will cause the air to quickly rise producing showers. Because of the rapid vertical motion there could even be a few rumbles of thunder or even small hail. Another interesting thing that may happen tomorrow is the possibility of waterspouts over Lake Michigan. The relatively warm water temperatures could help enhance the instability leading to a few waterspouts over the lake. Either way, should be an interesting day to see what happens! If you happen to be out that way over the weekend and see anything cool email your photos: weather@wtvo.com. Who knows, maybe we'll even get a few cold air funnels. The Autumnal Equinox was this morning (meaning fall has officially begun) at 4:04am local time. This occurs when the sun's most direct rays are on the equator. From here on out our daylight hours will be getting shorter and shorter until we reach the Winter Solstice in December and then the sun's rays will begin to migrate back north. Hurricane Hilary will not pose a threat to the United States, but it is already doing so for our neighbors to our south. Hilary is a category-4 storm as of this writing with 135 mph maximum sustained winds, located just offshore of the southwest coast of Mexico. It's moving to the WNW at 9 mph, and should stay offshore. Still, tropical storm warnings are in effect for portions of southwest Mexico due to heavy rains and high surf. Hilary will eventually weaken as it encounters the cooler waters of the open Pacific by sometime next week. It looks like we'll stay stuck under a persistent upper level low for the next several days and that will keep the cool temperatures, clouds and periodic rain chances with us through at least early next week. We've been talking about this upper low now all week and starting today and lasting through the weekend temperatures will be cool and our rain chances may in fact go up as we round out the work week. Yesterday's high of 69° wasn't too bad, although it still was below average, and we were able to see a fair amount of sunshine for most of the day. The reason, we were in the 'dry-slot' of the storm. Meaning there was dry air wrapping in on the southwest side of the low pressure system. This causes the clouds to clear, but usually increases the winds. We are now no longer within that 'dry-slot' as the main upper low has moved into Canada. If you were to look at a looping water vapor image you would notice these little counter-clockwise circulations moving through the Midwest. These are actually little disturbances, or as meteorologists call them vorticity maxes, that rotate around the main system. What's important for you to know is that ahead of these vort maxes the air is rising and behind them the air is sinking. Where you have rising air you build clouds and typically increase your chance for rain. Where the air is sinking there is typically less cloud cover. So, as each one of these moves through the Great Lakes they will continue to produce cloud cover and pretty much daily rain chances. Another thing you may have noticed today versus yesterday is the depth of the clouds (or maybe you haven't and it's just been me). The clouds are a little thicker than they were yesterday and that's because there is a much cooler pocket of air above us than there has been the past couple of days. Air will continue to rise as long as it's warmer than the environment it's moving into. So if you have a pretty cold layer above your air is going to rise a little more quickly. This creates a more unstable atmosphere - hence the deeper the cloud depth and the greater the chance of rain. So going into the weekend we will have both of these factors, cold pocket of air and vort maxes, that will keep the cloud cover and rain in the forecast. A 6-ton, inoperable NASA research satellite is expected to hit earth sometime early this weekend. The Aerospace Corporation in California expects the satellite to hit earth late Friday afternoon, give or take 14 hours. 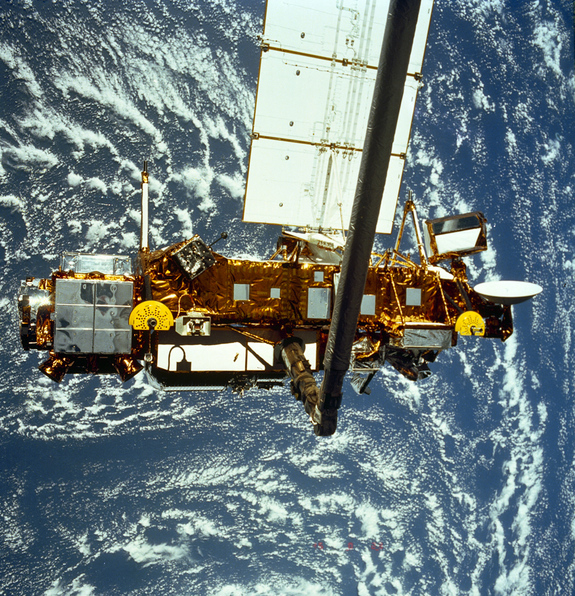 Most likely much of the satellite will burn-up in the earth's atmosphere before it hits, and it will probably land in the open waters of the Pacific Ocean. Still, NASA will be monitoring its progress closely. 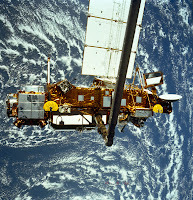 The satellite is 20 years old, and will be the biggest NASA spacecraft to fall uncontrolled from space in 32 years. Tropical Storm Ophelia formed last night in the Atlantic and is currently moving west at 16mph with maximum sustained winds of 60 mph. Ophelia will continue to move to the west and isn't really expected to develop much over the next couple of days. While Ophelia may not develop into a hurricane it could bring heavy rain and gusty winds to the Leeward Islands by the end of the week. Sunshine will prevail this morning as a wedge of dry air wraps in on the backside of a very strong area of low pressure that continues to spin through the upper Great Lakes. The low currently sits in Minnesota where rain showers and gusty winds will be found. Closer to home winds will be gusty at times from the west which will help keep a bit of a chill in the air for this afternoon. After yesterday's high of 77° we'll sit at about 70° for today. The surface low will continue to move east through today and tomorrow but the upper level low will eventually become cut-off from the main jet stream later tonight and tomorrow. As this happens, it will actually begin to move back into southern Wisconsin as a blocking high holds tight in the Atlantic. At the same time the jet stream will build north in the west causing temperatures to rise into the upper 80s. And as the old saying goes, "what goes up, must come down" the cut-off low in the Great Lakes will continue to pull cool air southward and keep temperatures in the low 60s for us. In fact, it doesn't appear as if the low will be in any hurry to depart and will stick around through the weekend. On May 22nd, one of the deadliest tornadoes in history struck Joplin, MO. An EF-5 twister killed 59 people and injured more than a thousand others in this southwest Missouri town that day. This tornado was the first one to claim more than 100 lives since the Flint, MI tornado of 1953. 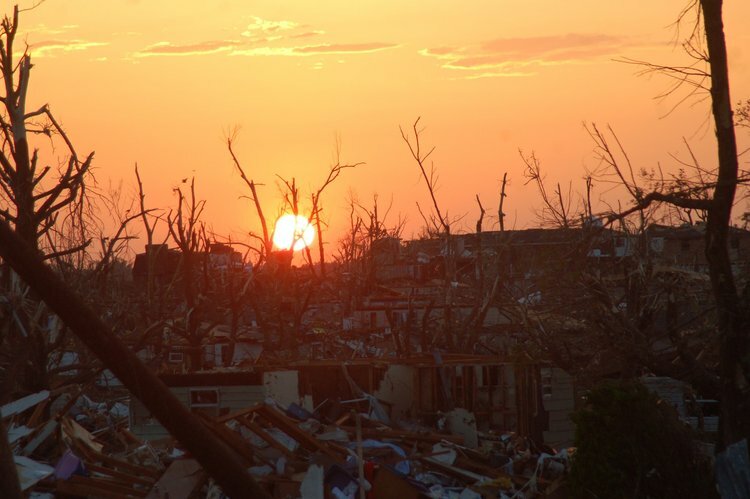 Due to the rare nature of this natural disaster, the NWS Central Region Headquarters has prepared this assessment to help reduce fatalities the next time a major tornado strikes a populated area. For the full assessment, click here. Areas of fog will persist this morning across northeast and central Illinois. In fact, a Dense Fog Advisory was issued earlier this morning for DeKalb County and has now been extended through 10am. For the rest of us hazy sunshine will continue as a south wind increases dew points ahead of a cold front that stretches back through the Plains. Watch for changing visibility while out and about this morning. A strong area of low pressure is currently moving through the northern Plains this morning and will continue to move east into Minnesota and then into the upper Great Lakes by this evening. While we won't be directly impacted by this low, a cold front will move through later this evening and overnight helping to pull down much cooler weather for the end of this week. Very gusty winds can be found through the Plains and upper Midwest as some gusts overnight have been close to 50-55mph. High Wind Watches and Warnings have been issued for the states closer to the center of the low. While it will be gusty at times for us, I'm not expecting any gusts quite that high. The bulk of the storms have remained centered around the low but there have been a few showers that have developed over Iowa early this morning. This is a result of warm air advecting, or being brought in, from the south. These showers will likely continue to the west and may even clip our far northwest counties later this afternoon but most of us should remain dry until the cold front moves through later this evening. Once the front passes it appears as if the atmosphere will become blocked with sprawling high pressure in the Atlantic and another one in the west. This will cause a cut-off low to develop and basically spin over the Great Lakes into this weekend. This means the cooler weather and periodic rain chances will persist through at least Saturday, if not Sunday. With 0.61" of rain officially tallied at the Rockford Airport Sunday and this morning, the soil and adjacent low levels of the atmosphere are fairly moist across the Stateline. (In fact, our forecast low temperature for tonight is in the upper-40s while our dewpoint as of this writing is still 54!) Clear skies and light winds will allow temperatures to fall to the dewpoint by early Tuesday morning, and fog will form. Fog will be locally dense, especially in low-lying and rural areas. Therefore, drive with caution and use your low-beam headlights until the fog lifts by sometime mid-morning. Drizzle and even a few light showers will continue through this morning as a weak area of low pressure lifts through southern Wisconsin. Fog, dense in some spots, has also developed and will probably last through mid-morning. As dry air moves in behind a cold front skies will gradually clear by this afternoon and temperatures will warm into the low 70s. A weather system moving is moving northeast across the area tonight. There will be occasional showers, and drizzle overnight. Temperatures will hold steady in the upper 50's with the cloud cover, and the rain tonight. Monday will start out cloudy, but it will become partly cloudy, to perhaps even mostly sunny, by late in the afternoon. It will be warmer with a high in the low 70's with northwest winds 10-15 mph. It will be warmer, yet on Tuesday, rising into the upper 70's, with lots sof sunshine. There is a slight chance of showers on Tuesday night with the passage of the next cold front dropping in from the northern plains. It is supported by a strong trough of low pressure aloft, and it's associated cold air. It will be breezy on Wednesday with cooler northwest winds blowing. Even though there is very little moisture available for this system, the instability created by the cold air aloft will give the Stateline chances of showers off and on from Wednesday through Friday with the stalled system overhead. It will be cool, too, with highs in the 60's and lows in the 40s. By Saturday the trough will be off to the east, and surface high pressure will take over providing more sunshine, and gradually warming temperatures. By Sunday the afternoon temperature will be back in the low 70's under mostly sunny skies. A weather system developing over the plains is drawing moisture northward out of the Gulf of Mexico into the Midwest. Clouds will increase overnight...lowering and thickening through time, and there may be some light rain showers over far northwestern Illinois after midnight. Rain will overspread the area on Sunday making for a wet day across the Stateline. The clouds and the rain will hold temperatures in the middle 60's. The could even be some thunderstorms as the air gets more unstable during the afternoon into Sunday evening. Rain showers will gradually end overnight. On Monday skies will become mostly sunny, and temperatures will warm up into the low 70's. The warming trend will continue into Tuesday with a high around 76 degrees under mostly sunny skies. A new weather system will move southeast out of the plains on Tuesday, and push across the Stateline on Tuesday night. It will have limited moisture to work with, so only scattered showers are expected. Cooler air will fill in behind the front on Wednesday under partly cloudy skies. Highs will drop back to the middle to upper 60's, and lows will fall to the middle to upper 40's, but skies will be mostly sunny Thursday and Friday. High pressure will moderate as it moves east, and by next Saturday the afternoon temperatures will be back in the low 70's under mostly sunny skies. Cold Canadian high pressure is located over eastern lower Michigan this evening. The backside of the retreating high has been over-run by a disturbance that produced clouds all day and some light rains this afternoon. The light rains are shifting off to the east, but it will remain cloudy overnight. Winds will be light easterly, and the temperature will drop into the middle 40's. Clouds will decrease on Saturday, and it may even become mostly sunny in the afternoon. The sunshine will allow temperatures to moderate into the upper 60's. A disturbance lifting northeast out of the central and southern plains will have Gulf of Mexico moisture with it, and showers will develop on Sunday. There could even be some isolated thundershowers Sunday afternoon and evening. A front sweeping across the northern and central plains will bring an end to precipitation on Sunday night. It will be mostly sunny and warmer on Monday with a high in the middle 70's. As high pressure fades to the east today the clouds and even a few light rain showers will be possible as an upper level disturbance treks across the Midwest. There are already a few showers falling in eastern Iowa and it will probably take a little time before they reach north-central Illinois but I would expect a few in here by early this afternoon. Unfortunately, it's going to be a cloudy day and as a result temperatures this afternoon won't make it much past 60°. Cold Canadian high pressure dominates the weather across about on third of the nation this evening. The core of the high will move out of Minnesota this evening, across Wisconsin tonight, and be located over Lower Michigan by early Friday morning. This area of high pressure was responsible for some patchy frost early on Thursday morning. There would be more frost tonight were it not for some cloud cover moving in from the west, and sliding up over the high pressure. These clouds should prevent enough heat from escaping out to space tonight to prevent any frost from forming. It will still be quite cold, however, with the temperature dropping to the upper 30's or around 40 degrees by 6 am on Friday morning. These clouds represent warmer air moving in from the west, and it appears as if it will be a mostly cloudy day on Friday. The high temperature will be in the upper 50's. A gradual warming trend will set in over the weekend. 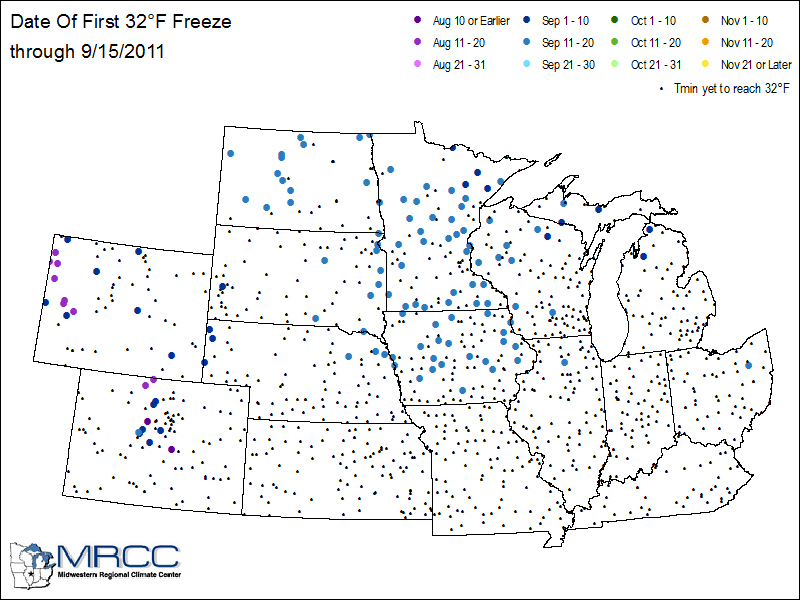 The Midwestern Regional Climate Center has put together a regional plot of the reporting stations that have recorded 32° so far this season. Each colored dot represents a certain time period. Notice how a lot of the stations have reported reaching 32° just within in this week across Wisconsin, Iowa and Minnesota - probably just within the past couple nights. There is even on spot in far southern Lee County. The black dots are where low temperatures have yet to reach the freezing mark. Temperatures tonight could fall back into the middle and upper 30s, especially if the cloud cover doesn't get too thick overnight. ﻿﻿﻿Low temperatures this morning fell into the middle and upper 30s! Freeport and Rochelle fell to 34° while Rockford dropped to 37°. There were even a couple reports of frost across the region. Even though skies will remain mostly sunny this afternoon highs will only reach the upper 50s to near 60°. Lows tonight could fall back into the middle 30s as long as skies remain clear. There may be a few clouds that move in overnight and that would limit how far we drop by Friday morning. For now, I'm going with a low of 37°. A sprawling area of Canadian high pressure centered over North Dakota has cleared the skies over northern Illinois. Temperatures have tumbled into the 40's as of 9 pm and will continue to drop into the middle 30's by late tonight.. There are frost advisories after midnight to the north and west of Rockford, and there could be some patchy frost in favored low lying areas over northern Illinois. On Thursday skies will be sunny, but it will be chilly with highs struggling to reach 60 degrees by mid afternoon as the high moves across Minnesota into central Wisconsin by Thursday evening. Skies will be clear again on Thursday night, and with light winds, good radiational cooling will allow temperatures to reach the middle 30's again producing some scattered frost in rural areas. By early Friday the core of the high pressure will be located over Michigan, and winds will become southeasterly, and by Saturday, southerly winds will slowly start to warm the chilled mid west back up into the 60's. Moisture will spread northward into the the area by Sunday. Scattered showers and thunderstorms will be affecting the area off and on from Sunday through next Wednesday along with seasonal temperatures in the 70's. A few light showers have developed around I-88 this morning as a cold front combines with a little disturbance moving out of the central Plains. These, for the most part, will remain to our south. Skies will stay mostly cloudy through the morning and probably into the early afternoon as a lot of chilly air is found behind the front. As high pressure moves in later this evening and overnight winds will begin to calm - especially to our north and west, allowing temperatures to possibly fall into the middle 30s! Freeze Warnings have been issued for all but the far southeast portion of Minnesota, northern Iowa and parts of the Dakotas for tonight into early Thursday morning. Meanwhile, a Frost Advisory has been issued for northeast Iowa and western/southwestern Wisconsin - including Green County. Temperatures in the upper Plains and Midwest are expected to drop below freezing almost putting an end to their growing season. North and west of Rockford I feel will have the best shot of reaching at least the middle 30s tonight. We'll have the same set up for Thursday night, however, a few mid-level clouds may move in and keep lows from dropping too much. Either way the patchy frost wording remains in the forecast. You might want to bring in any plants that you can and cover the ones you can't just to be on the safe side. 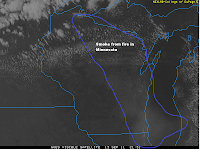 NORTHERLY WINDS BEHIND THE FRONT HAS TRANSPORTED SMOKE ALL THE WAY INTO NORTHERN ILLINOIS. THE SMOKE WILL LIKELY PERSIST THROUGH THE AFTERNOON AND INTO THE OVERNIGHT HOURS BEFORE WINDS BECOME MORE WESTERLY IN ADVANCE OF ANOTHER COLD FRONT WHICH WILL APPROACH EARLY WEDNESDAY MORNING. SMOKE WILL LIKELY CONTINUE TO SPREAD TO THE SOUTHEAST ACROSS MUCH OF NORTHEAST ILLINOIS AND NORTHWEST INDIANA THROUGH THIS EVENING. EXPECT HAZY SKIES AND A DISTINCT BURNING ODOR. 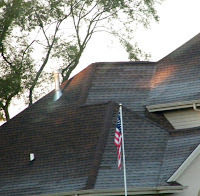 THE LAKE COUNTY ILLINOIS EMERGENCY MANAGER REPORTS THAT SMOKE IS PREVALENT ENOUGH TO CAUSE PEOPLE TO REPORT DIFFICULTY BREATHING AND BURNING OF THEIR EYES. 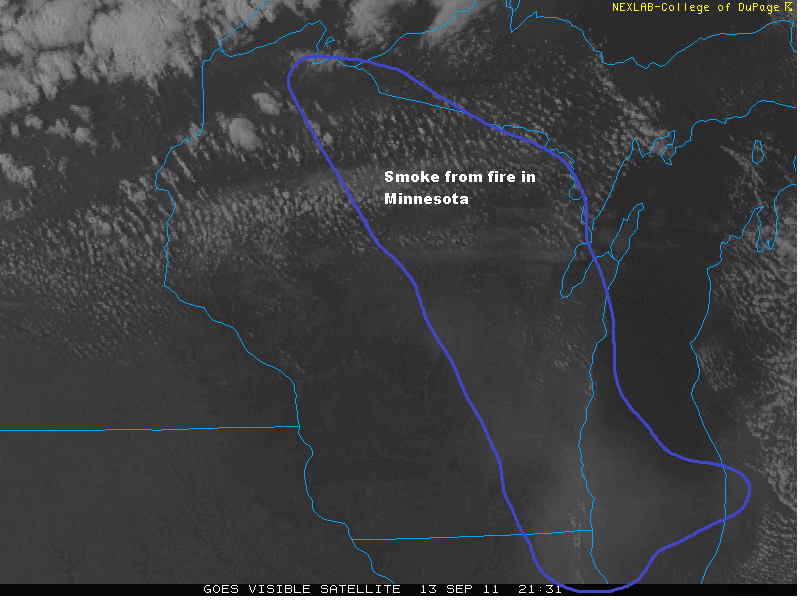 INDIVIDUALS WITH RESPIRATORY PROBLEMS SHOULD USE CAUTION WHILE SMOKE AFFECTS THE AREA. The first of two fronts passed through early this morning and will keep a gusty northwest wind coming in throughout the day. Temperatures upstream in Iowa and Minnesota are currently in the 50s so with the cooler air being brought into the Great Lakes, look for highs to reach about 70°. The second front will move through Wednesday morning and this will be the one that really drops our temperatures; not only afternoon highs but overnight lows. As the second front comes through tomorrow, there may be enough moisture to squeeze out a sprinkle or light shower but there will be a lot of dry air coming in behind. So once that front passes Wednesday afternoon skies should begin to clear. A large area of high pressure, which has originated from northern Canada, will then settle into the Midwest. While locations very close to the center of the high will likely see temperatures drop by Thursday morning into the middle 30s, I think there is going to be enough of a breeze to keep us close to 40° - especially around the Rockford area. Now some of the outlying locations could be a few degrees cooler. By Thursday night, the center of the high will have moved almost directly overhead and that should allow our winds to calm and keep skies generally clear. That combination would allow temperatures to drop into the middle/upper 30s by Friday morning. Because both Wednesday night and Thursday night have the potential for lows in the 30s, I'm going to keep the patchy frost mention in the forecast. On average we see our first frost during the first week of October. So if this were to occur we would definitely be above schedule! Maria Not a Problem for U.S.! We're just two days past the climatological peak in the Atlantic Hurricane Season, and things are actually looking pretty quiet! Tropical Storm Maria is the only named storm in the Atlantic basin right now, and it poses little or no threat to the U.S. coastline. Some higher surf is about all that we're expecting for the Northeast and mid-Atlantic states. Outside the U.S., the Virgin Islands and Puerto Rico could see tropical storm force winds and rainfall amounts of 2-6" through tomorrow. Maria currently has maximum sustained winds of 50 mph and is located 800 miles south/southwest of Bermuda. It is currently moving northwest at just 2 mph. Despite Maria's slow movement, the storm will not linger. It is expected to pick-up speed and curve more to the north and northeast in the coming days. If you thought early last week was chilly, just you wait until the middle of this week! While we'll enjoy the middle 80s this afternoon a very strong cold front is looming across the northern Plains. This front will sweep through late tonight and because there is little moisture associated with it there is only a slight chance of a shower or thunderstorm. While this will cool us Tuesday afternoon by about 15° from today's high, a stronger front will come down Wednesday. This will be accompanied by a very strong area of high pressure with an air mass that has originated from far northern Canada. Winds will remain from the north/northeast Wednesday and temperatures for both Wednesday, Thursday and Friday will be in the low 60s; with Thursday being the coldest. To add insult to injury overnight lows will fall into the upper 30s/low 40s. I feel the best night for us to reach the upper 30s will be Thursday night as the center of the high settles in overhead and our winds will likely calm - setting up a very good scenario for radiational cooling. Although I wouldn't be surprised if some of the more outlying rural areas on Wednesday night maybe squeeze out a 38° or 39°. These cool temperatures could lead to the potential development of frost! Keep the photos coming! I have a feeling we'll be seeing a lot more signs of fall in the coming weeks! Sprawling high pressure will provide warm conditions under sunny skies on Monday. Temperatures will reach the middle 80's, and it will become breezy in the afternoon as a vigorous area of low pressure advances along the Canadian border just north of Minnesota. A strong cold front will trail that low as it progresses eastward, and it will sweep across the Stateline on Monday night along with a slight chance of showers and thunderstorms. In fact, no rain may materialize at all, because the system is moisture starved with the Gulf of Mexico cut off from the Midwest. It will be considerably cooler on Tuesday behind the cold front with afternoon highs in the low 70's under mostly sunny skies. A secondary re-enforcing cold front will move through northern Illinois by daybreak on Wednesday. Unseasonably cool air will follow in behind that front from northern Canada. The high temperatures will be in the 60's for the rest of the week through Saturday, and the lows at night will be in the 40's, with the exception of Thursday night, when it could drop into the upper 30's. Skies will be clear from Friday through Sunday as the huge Canadian high pressure moves across the Great Lakes into New England. It's been ten years since that horrific morning where so many lost their lives, but many become heros. Please take a moment today to remember those that were lost and the loved ones they left behind. The very odd weather pattern that we have seen for the past few days is about over. The remains of T.S. Lee have backed all the way west and southwest into western Arkansas. As it backed across Indiana and southern Illinois it pulled moisture and clouds into the Stateline all the way from the Atlantic Ocean. This is a bit unusual to say the least with showers moving west across Indiana and Lake Michigan into northern Illinois. Most of them have been fairly light, but there have been some isolated heavier showers. No rain is expected tonight with the remains of Lee continuing to weaken, and gradually it will be picked up by the normal westerly flow that is in the process of re-establishing itself. Warm high pressure from the northern plains will dominate Stateline weather for the next couple of days. Temperatures will drop into the upper 50's tonight under mostly clear skies, and rise to around 84 degrees on Sunday with sunshine. It will be mostly sunny and warm again on Monday with a high in the middle 80's. It will become breezy by afternoon with a strong cold front approaching from the northwest. There is a slight chance of showers and thunderstorms on Monday night with the approach and passage of the cold front. It will be mostly sunny, windy, and much cooler on Tuesday with temperatures struggling to reach 70 degrees, and the rest of the week high temperatures will only be in the 60's. Overnight lows will be in the 40's, and possibly even as low as the upper 30's on Thursday night. Soon fall will officially be upon us as leaves begin to change colors, farmers are in the fields and the veggies will be coming out of the garden. These are a few of the 'Signs of Fall' photos I have received so far. The first is from Jane Aschtgen Bowen who said 'This is a true sign of fall - Harvest and Producing Good Food from the harvest!!'. The next two are from Dom Castaldo; the first is of the Mt. Morris Jr. High Marching Band and says 'Every morning they have a parade'. The third photo is a harvest of his chili and habanero peppers! Yummy!! We'll continue to feature these photos on the WTVO Channel 17 Morning News. Are we heading into another winter like last year? The Climate Prediction Center has issued a La Nina Advisory meaning La Nina conditions are observed and are expected to continue. La Nina conditions returned in August 2011 as sea surface temperatures remained negative across the eastern half of the equatorial Pacific Ocean (figure on the left). Last month the CPC had issued a La Nina Watch meaning that there were some signs that supported the redevelopment of La Nina during the 2011-2012 winter season. The atmospheric circulation over the tropical Pacific has continued to exhibit La Nina characteristics, although to a weaker extent, but also the low level easterly and upper level westerly winds persisted over the central tropical Pacific. These are all indicators that reflect the return of La Nina conditions. So what does this mean? Well, it could mean that once again the northern Plains will be cold and snowy (maybe not quite as much as last winter), there could be a few more cooler season severe weather episodes and above average precipitation along the Pacific Northwest. Definitely something to keep an eye on the next couple months. All of this 'cool' weather lately has really gotten me in the fall mood. I guess maybe it's because it's my favorite season. Now even though we still technically have a few more weeks left of summer we may start to see a few signs of fall by the end of September. So now I pose this challenge for you. I want you to send me your 'Signs of Fall' photos and we'll get them on the WTVO Channel 17 Morning News. It could be of the leaves changing colors, farmers getting into the fields when it's time to harvest or even of some local football games! Email them to: cking@wtvo.com and I'll get them on during the morning! As Meteorologist Candice King mentioned in a previous post, the southern Gulf of Mexico was/is an area of concern for tropical development this week. Sure enough, we now have Tropical Storm Nate located about 140 miles west of Campeche, Mexico. Nate has maximum sustained winds of 45 mph and is nearly stationary. Uncertainty in Nate's track is fairly high at this point, but it appears that southern and eastern parts of Texas could see some needed rainfall with this. Unfortunately, it could be too much rain at once and it could come with high winds and heavy surf. Nate could become a hurricane by Friday, so this system bears watching! The remnants of Lee have begun to lift north into Ohio and will eventually move west into central Illinois by Friday. As this happens the clouds will be on the increase from east to west late on Thursday. A few light rain showers will be possible, but I believe the threat will be east of the immediate Stateline area. With several days of cool, dry air it's going to take some time for our atmosphere to saturate. Besides the cloud cover the winds will also increase Thursday and Friday as the difference in pressure will be high between the cut-off low and the high pressure in the northern Plains. Winds could occasionally gust to 30 mph during the afternoon. Rain showers will be possible into Saturday but the cut-off low will weaken and lift east which should give us a dry day on Sunday. The Atlantic has been showing a little more life lately. First, hurricane Katia has been downgraded to a Category One hurricane with winds sustained around 90 mph. Katia is not expected to make a direct impact on the U.S. because she will get caught up in a trough of low pressure in the jet stream and that should lift her north and then northeast by this weekend. Increased rip currents and high waves will be a problem, though, for the Carolinas. A little further to the south and east is Tropical Depressions 14. It's currently moving to the west around 20 mph and has winds around 35 mph. There is some potential that this could become Tropical Storm Maria within the next day. Tropical Depression 14 has developed a little further south than Katia and if it were to maintain its strength would have to be watched for a possible impact on the U.S. Meanwhile, a broad area of low pressure has formed in the southern Gulf of Mexico and has about a 60% chance of developing into a tropical depression later this week. The first game of the NFL season is scheduled for 7:30pm local time on Thursday night. It takes place at Lambeau Field in Green Bay, WI. Of course, that's only about 150 miles northeast of Rockford the way the crow flies. Although we have a slight chance of showers in the forecast for Thursday night in Rockford, chances for rain in Green Bay will be virtually nil. This is because the upper-level low that will be centered somewhere over Indiana or Ohio will be positioned a little to far to the south to spin moisture up into east-central Wisconsin. Therefore, the NFL opener will be played under mostly clear skies with light winds and a kick-off temperature around 66 degrees. A very strong area of high pressure stretches from the central Plains northeast into Quebec this morning. With a light breeze and clear skies temperatures overnight fell all the way to 41° in Freeport to 43° in Rochelle. A dry atmosphere in place should allow us to warm back to 70° this afternoon under mostly sunny skies. Although that dry atmosphere tonight will cause temperatures to fall back into the middle and upper 40s by Wednesday morning. ﻿﻿﻿﻿﻿Wildfires continue to burn in Texas following what has been a very devastating year in terms of the drought and heat. 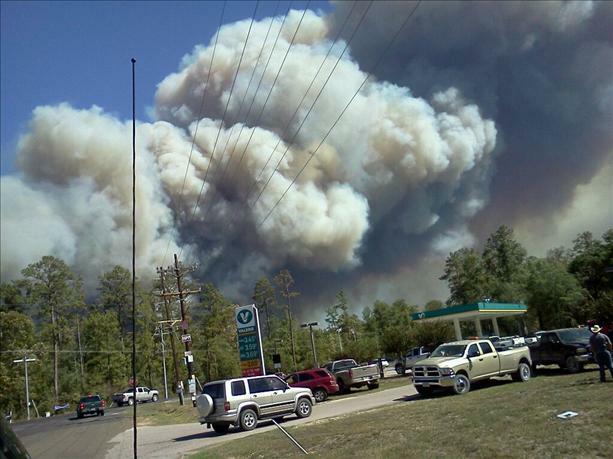 According to the Texas Forest Service they responded to over 60 new fires Sunday that burned 32,936 acres; 22 of those were new, large fires. Evacuations continue for many in the Lone Star State and unfortunately it really doesn't look like much relief is on the way. The only real silver lining is the extreme heat that has been felt for all of this summer has broken as the jet stream has shifted a little further south. Many residents and officials had hoped that Tropical Storm Lee would have brought some beneficial rain over the weekend, but instead it remained further east and the strong, dry winds on the backside of the caused a lot of the ongoing fires, or new ones, to spread quickly. Over the weekend, officials in Texas had made a plea for help from surrounding areas because what little resources they had left from fires earlier in the season were basically gone. Even though the temperatures have cooled some it really doesn't appear as if any relief in the drought will occur. Some indications are suggesting that relief won't come until at least November! The latest drought monitor shows pretty much all of Texas is in an exceptional drought.